Please read the section "Important Notes" before purchasing or using this app. Returns or credit cannot be granted after purchase. This app has absolutely no in-app purchases! In a world where large monsters roam, and people everywhere make a living hunting, there's a remote village of people who follow a different set of customs. They are the Monster Riders, a people who don't hunt but instead form bonds with monsters. The monsters that form kinships with Riders, known as "Monsties," possess incredible powers. By becoming a Rider, you too can befriend countless Monsties, riding them as you explore a vast, exciting world. Join the adventure and "Ride On!" Monsties, and the bonds you form with them, are the backbone of your adventure. Explore vast environments and dungeons to find monster dens, and bring back the eggs you find to hatch new Monsties! - Fight with your Monsties in Network Battles! Take your hero and the Monsties you've raised into battles with other Riders! Build a team of your favorites to challenge other players. - New features for the smartphone version! New improvements include beautiful high-resolution graphics, improved user interface, and a new auto-save feature! The story begins in a forest near the village of Riders. Three young friends—the hero, Lilia, and Cheval—stumble upon a shining egg. The trio perform a playful imitation of the Rite of Kinship, only to be shocked when it actually succeeds! The egg hatches, revealing a baby Rathalos, a flying wyvern also known as "the King of the Skies." The trio affectionately name him "Ratha," and take him back to the village. Days later, without warning, the village is beset upon by a monster infected by "the Black Blight." They manage to drive it away, but not before it devastates the town—and leaves indelible scars in the hearts of Cheval and Lilia. The hero receives a Kinship Stone from the Village Chief and officially becomes a Rider. Cheval and Lilia both leave the village, each on their own path. The hero, though separated now from childhood friends, partners up with the cheerful Navirou, and embarks upon a new adventure into the world of hunters. 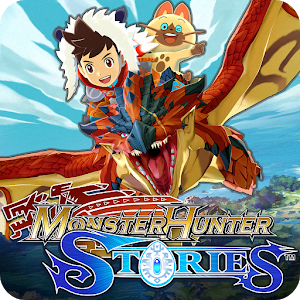 A story of friendship and triumph await you—ride on into the world of Monster Hunter Stories! - Multiplayer (Network Battles, etc.) is available only after a certain amount of game progress. - Network Battles are only available against other players of the paid Android version of this app. - Network Battles are not available against players of the Japanese version of this app. - Play in an area with a good connection to ensure the best online experience. - You must sign in to Google Play game services to use multiplayer features.